Enjoy $10 off your laundry bill with a minimum spend of $100. Key in coupon code SD100 when you book via our mobile app or online booking to enjoy the offer. Promotion is not valid with other promotions, discounts, offers, privileges and/or vouchers. A minimum order of $100 is required for discount to be valid. Discount will not be applied for order below $100. A delivery charge of $8 is applicable for order below $30. Promotion is valid only for orders taken from now to 31 March 2019. 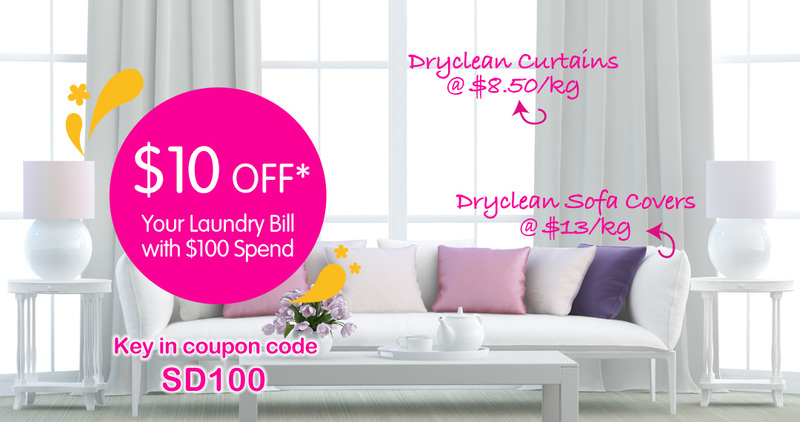 Please enter coupon code SD100 upon booking of service via Sunday Laundry mobile app or via www.sundaylaundry.sg only. Discount is not applicable for use on delivery and express service charges. Coupon code is valid for multiple uses. Standard Conditions of Service apply.